By now all bets are on that your Christmas tree is up in its full glory and your stockings are hung with care. I suspect that some of you are probably in full swing with your Christmas baking and others are struggling to find the time in their already busy and hectic days to shop, let alone bake. If you fall in the latter category, we have a fun Christmas candy recipe that is also quick and easy. Your kids will love helping make these and giving them as gifts. Maybe even Santa will score one! 1. Pour the white candy melts into a microwave safe dish. Heat the melts in the microwave in 30 second increments. Stir every time the microwave stops. Do this until the candy is fully melted. Allow the chocolate to cool a few minutes before using. 2. After allowing the white chocolate to cool a few minutes, scoop it into the small sandwich baggie. Squeeze the extra air out and make a small snip in the corner using the scissors. 3. To make the mittens, *make an outline of a mitten shape (see photo). My mittens were about 3” tall but not exact. I didn’t want to go any bigger as the chocolate is very delicate and breaks easily if made too big. Next, go back and forth with the white chocolate filling the mitten in. Sprinkle with a few of the green & red holiday sprinkles. Repeat, step until you’ve used all your white chocolate. *you might want to practice a few times but I found it wasn’t that hard and they don’t have to be perfect. 4. Once all your mittens are made and sprinkled. Allow the chocolate to fully harden (about an hour on the counter and only 15-20 minutes in the fridge). 5. Once your mittens have set, repeat step #1 with 6 oz. 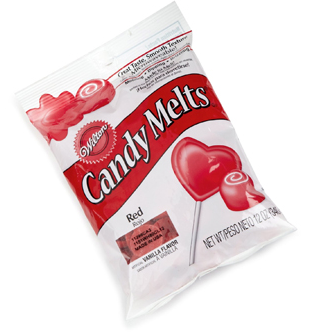 of the red candy melts. 6. Use the red melted chocolate to make the mitten cuff (see photo) and then fill in with the red. Pour the white candy melts into a microwave safe dish. Heat the melts in the microwave in 30 second increments. Stir every time the microwave stops. Do this until the candy is fully melted. After allowing the white chocolate to cool a few minutes, scoop it into the small sandwich baggie. Squeeze the extra air out and make a small snip in the corner using the scissors. To make the mittens, *make an outline of a mitten shape (see photo). My mittens were about 3” tall but not exact. I didn’t want to go any bigger as the chocolate is very delicate and breaks easily if made too big. Once all your mittens are made and sprinkled. Allow the chocolate to fully harden (about an hour on the counter and only 15-20 minutes in the fridge). Once your mittens have set, repeat step #1 with 6 oz. of the red candy melts. Use the red melted chocolate to make the mitten cuff (see photo) and then fill in with the red. **I recommend storing the chocolate mittens in the fridge until ready to serve or giving as a gift. If you let set out too long the chocolate doesn’t melt but does get soft and makes it easier to have the mittens break a part. These mittens are so cute. I love that they have the holiday colors on them. I thought those were cookies! You totally got me in the most delicious creative way!!! 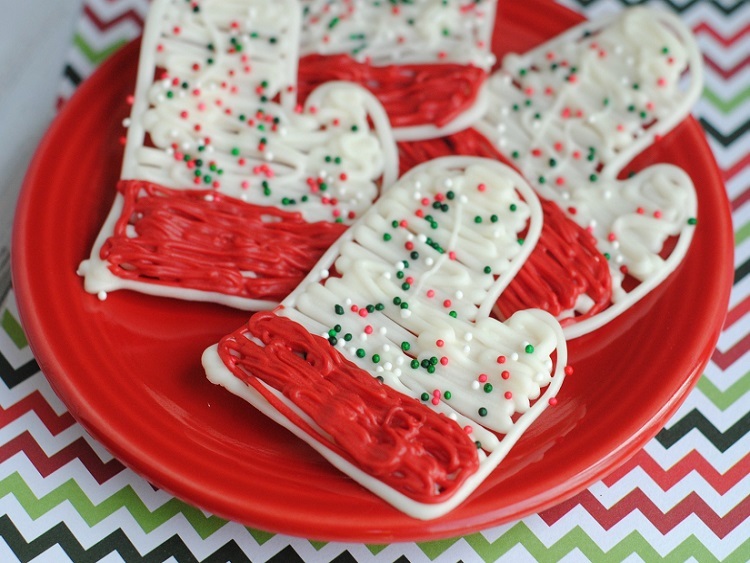 I used to have a mitten cookie cutter that I could make these cookies with. I wonder if my Daughter has it now. 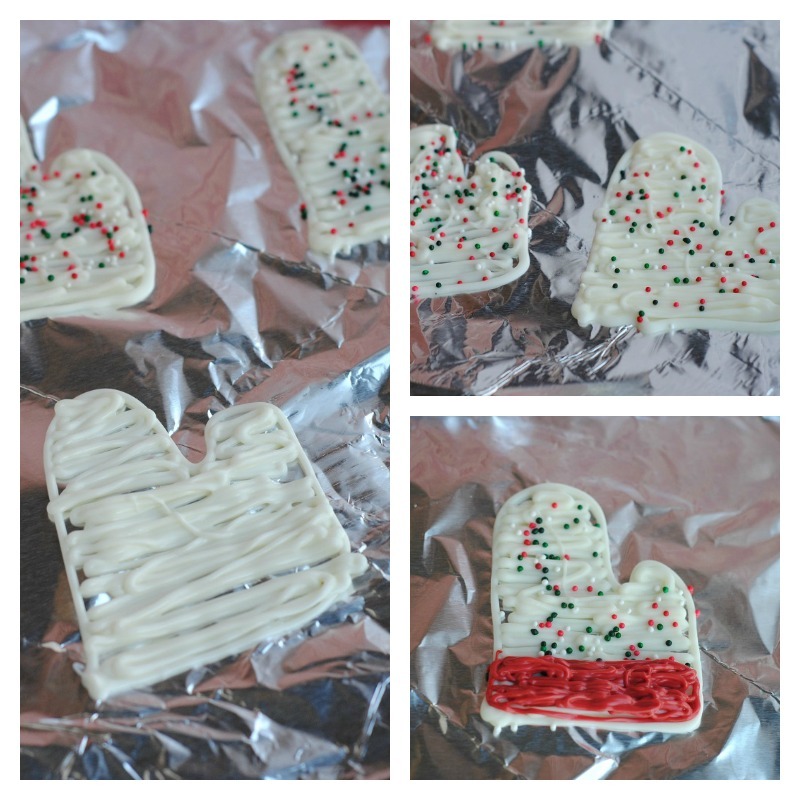 I think I could use the cookies cutter to outline the melted candy with….. Do you think it will work? Yes, I do think it would work well to help you outline it. Great idea! That is a cute idea! I love candy melts – you can do so much with them! I love these mittens. I use that candy as my mom and I make a lot of homemade candy. How cute are these? I don’t know if my hand is steady enough for this one. Oh my gosh, how cute! I always make candy during the Christmas season and these are just too cute. Those are beautiful candy melts, at first I thought they were cookies but now after seeing up close, they are most definitely candy melts! I love the pretty design you did, these are perfect for a holiday party. These are adorable and look delicious. My kids love decorating cookies so this would be a fun project to do with them! Those are so cute, and I love that I could rationalize eating these mittens in pairs! These are adorable. I will have to add these to my Christmas treat list. These are really cute. They would be perfect for our school party this Christmas! What cute little mitten cookies, I’d love to get my hands on these! I love these cookies, they look so adorable; I’d love to make them! I never would have would have thought to make these. These are so cute!! Oh my goodness how cute are those!? My daughter is supposed to bring a snack for a Christmas party next week, I think I will make these! What a cute idea my son would love this. I think this may be something I can actually pull off. oh man I want to try these. These look so good that I don’t think they’ll last any time in my household if I make them. These are cute! I wish I had the time to make some. I haven’t baked a thing or made anything sweet for the holidays. Although, today I am doing the popcorn balls for the tree. My daughter’s having a friend sleep over, this would be the perfect thing for them to do. I really wish I’d seen these before Christmas, I love them! I’m trying this next year! (Well, this year I guess). Actually, I think I’ll try something similar for Valentine’s Day. 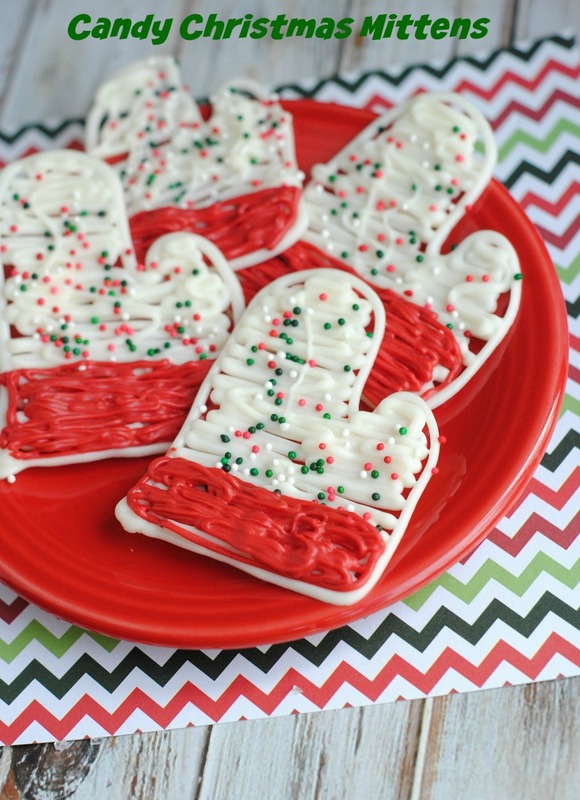 The red and white mitten cookies are absolutely adorable. I wasn’t able to bake this past Christmas, but I am saving the recipe and instructions for next year. Aw I love these! We’ll have to try them sometime! I would definitely would love to try the Red & White Candy Christmas Mittens. I think it is a great plate, of which it’s on my menu later in the week. These are so darn cute, and much easier than I expected. I’d love to try this.